We have already mentioned in a very cursory way that in the roughly ten years beginning with Karl's departure from the Jesuitengymnasium in Brünn to Franz Theodor's appointment as Principal of the school in Himmelpfortgrund two sisters enter the story: Elisabeth and Magdalena Vietz. Elisabeth would become Franz Theodor's first wife and Magdalena Karl's second wife. What do we know of them? Almost nothing. Into this abhorrent vacuum down the years much gaseous nonsense has hissed. Inventions and suppositions become facts. These 'facts' are picked up and turn up even in respectable Schubert biographers. The only fact we have is that we have barely a single scrap of documentary record that we can rely on for the early years of the two Vietz sisters. Even when the Vietz girls enter our Schubert story, they are, as women, generally neglected by the writers of documents. The researcher Rita Steblin has done extensive work to recover the female side of the Schubert biography, with great success, but it is unremitting, hard work trying to recover female biographies from this era. Let us therefore go forward cautiously and see if we can make out in the murk of three tumultous centuries at least some shadowy outlines for these two sisters. They were born in Zuckmantel, as its German name was then, Cukmantl in Czech until 1948 and then, after the expulsions of all ethnic Germans from the area, it became Zlaté Hory, 'Golden Mountains'. The town is in Silesia, but after Frederick II ('the Great') managed to gain possession of most of Silesia during the War of the Austrian Succession (1740–1745) it became a border town between Prussian Silesia and the tiny Austrian Silesia. During the conflict the town suffered greatly, being plundered and almost razed to the ground by the Prussians in 1741. Zuckmantel had been an important centre for gold mining. When that fizzled out it concentrated on linen production, in which, however, it was always a small fish in a very large Silesian pond. This activity, too, gradually reduced in importance and the area became ever poorer. As if this weren't enough misery for the region it became another important centre for religious persecution, of which the local speciality was roasting witches in ovens. In the 18th century Moravia and Silesia also achieved notoriety for their vampire superstitions, beliefs which the enlightened ones in Vienna spent much effort trying to eradicate. In short, a good place to leave. Vienna had called the Schubert boys; it would also call the Vietz children. 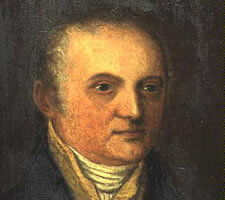 The father of the Vietz family was Franz Johann Vietz. 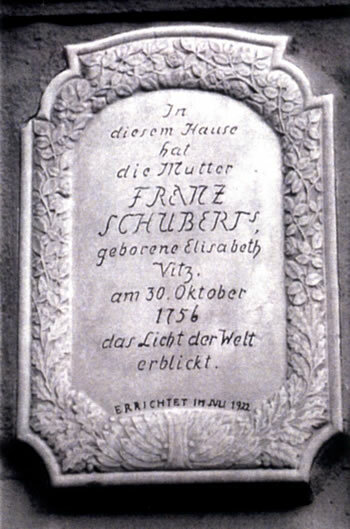 He was born in Zuckmantel on 4 October 1720, or possibly 4 September. He married Maria Elisabeth Konstanze Riedl (b. 1 November 1724) on 6 July 1745. He was 24 years old, the blushing bride 20. As far as we know they had three children who survived to adulthood: Felix (b. 14 January 1748), Maria Elisabeth Katharina (b. 30 October 1756) and Maria Madalena (b. 15 July 1763). We note, without reading too much into it, that, in this region beset by conflicts, Felix was born at the end of the War of the Austrian Succession (1740–1748), Elisabeth at the start of the Seven Years' War (1756–1763) and Madalena in the year of its conclusion. The atypical large gaps between the births are interesting, but, in the absence of any further evidence, we leave that thought and move on. The Vietz house in Zuckmantel. 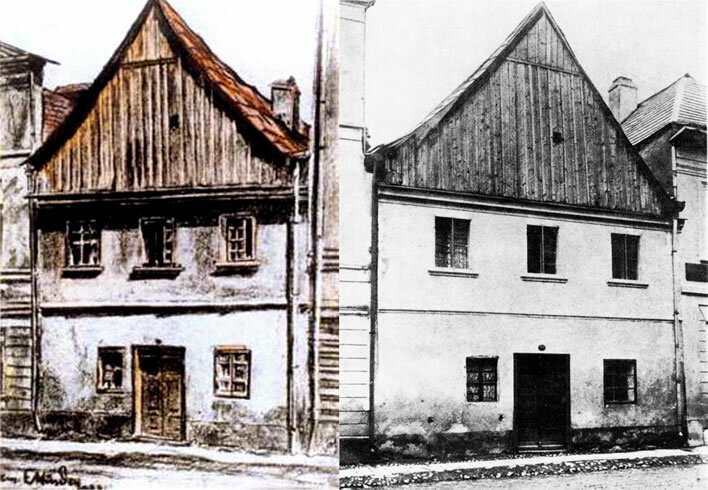 Left: a tinted charcoal drawing by Erich Hürden from 1922. Right: An undated photograph. In this house the mother of FRANZ SCHUBERT, née Elisabeth Vitz, on 30 October 1756 first saw the light of the world. Erected in July 1922. We don't know with any certainty when the mother or the father of the family died. The only thing we know is that at some time before 1782 one, two or all three of the children ended up in the imperial capital, Vienna. There is a tale that a certain Johann Franz Vietz died in poverty in an inn in Vienna on 24 January 1772. The Christian names are reversed and the 51 year old is estimated to be 65.Furthermore, according to some, Franz Johann Vietz is supposed to have died four years before at home in Zuckmantel. No children are mentioned in this account, so it doesn't help us in any way to solve the problem: when did the Vietz siblings leave Zuckmantel and when did they arrive in Vienna? On reading the date 1772 the slightly drowsy reader will have perhaps awakened with a start, thinking 'hunger years'. Indeed, the problems of those hard times would have been as great in Zuckmantel as they were in Neudorf and Rohne, Hanso Nepila's village. Whether hunger drove them to Vienna or even killed their parents – well, who knows? We don't know. Nor do we know how they supported themselves after they arrived and when they met the Schubert brothers. If we just take 1772, the year of the supposed father's supposed demise as a useful marker, we find that Felix was 23, Elisabeth 15 and Magdalena 8 years old. They start to pop up in the official records of Vienna from 1783 onwards, that is, over ten years after their supposed arrival in 1772. We ask ourselves: where were they? What were they doing? – No idea. Elisabeth appears first, as the mother on the death certificate for her illegitimate child in 1783. She is recorded merely as a 'single person'. If the child is Franz Theodor's, then she was in Vienna in 1782. For Felix we have a marriage certificate from 6 April 1784. His occupation was given as an apprentice weaver. He will turn up once more in 1805 when he, his wife and their three children stay in the Schubert house at Himmelpfortgrund. By that time his fortunes had worsened, so we find him as a 'jobbing worker' without a fixed occupation. As we have already noted, Elisabeth appears again on a residence permit when she moved in with Franz Theodor in September 1784 – she was an 'unattached servant girl', that is, a servant without a fixed employer. On the marriage certificate a few months later she was simply the 'daughter of a master lockmaker/metalworker'. Magdalena first appears three years later, in 1787, now the 24 year old mother of an illegitimate child, Franz Viez, born 2 October. Her occupation was 'servant girl'. The girls from Zuckmantel, despite their impoverished condition and low social status, offered two great advantages for the two brothers. Firstly, they were from the same region and would have spoken a common North Moravian/Silesian dialect. Neudorf and Zuckmantel are only 40 km apart. It has been suggested that the Schuberts and the Vietz's knew each other in their home region. This seems improbable. There is no evidence at all for this assertion anyway so we can dismiss it out of hand. Secondly, the sisters were useful skivvies on whose household labour the boys could build their careers and their dynasties. Elisabeth produced the children, the food and kept the household and the school. Neither she nor sister Magdalena were required to bring anything else to their marriages. After Elisabeth died in 1812, finally skivvied-out at the age of 55, Franz Theodor, now established, married money. ^ Ezra Pound, The Cantos, op. cit., 'Canto XIII', p. 60., quoting Confucius, The Analects, VX, 25, ex. M. G. Pauthier, Confucius et Mencius, Paris, 1858, p. 192. ^ Steblin, op. cit. p. 254 also discusses the defects of this story. ^ Steblin, op. cit. passim has extensive detail about Elisabeth's first born child.